Other Events: Times will vary. Review the Event Guide for the specific event you are interested in attending. The Ticket Office is located directly across from the ProShop. Gillette Stadium provides wheelchair and companion seating with enhanced sight lines on every level of the stadium and at all price points. For more information, please review one of the Accessible Seating Maps listed above. Guests who acquire tickets to an event at Gillette Stadium via secondary markets (e.g., Ticket Exchange) but who need to be relocated to a designated accessible seating location are required to exchange tickets day of event. Please be advised that such exchanges and relocations are subject to availability and are accommodated on a first-come, first-served basis. Guests should visit the Ticket Office prior to entering the stadium, or once inside, the Advanced Ticket windows located at midfield on both the east and west sides of the Main Concourse (and Upper Concourse when open) to seek accommodation. For more information, call (508) 384-9191 / MassRelay (800) 439-2370. We also recommend you visit our Accessible Services page. Patriots: All guests in attendance at Patriots home games require a ticket to gain entry into the stadium, regardless of age. Revolution: For Revolution matches, children ages two (2) and under do not require a ticket. However, all other guests do. Other Events: The policy for all other stadium events will vary. Please review the Event Guide for details regarding the specific event you are interested in attending. Every year, millions of fans throughout the country purchase counterfeit tickets that are not valid and will not allow entry into a venue. Gillette Stadium takes a proactive stance by educating the general public about counterfeit tickets. Gillette Stadium, the New England Patriots, and the New England Revolution do not endorse or condone the reselling of tickets to any Gillette Stadium events. Any unlicensed person reselling tickets by any method, and any licensed person reselling tickets on an auction website or in violation or applicable law, is subject to loss of ticket privileges. Use of tickets for advertising and promotional purposes (including contests and sweepstakes) is prohibited. Gillette Stadium, the New England Patriots and the New England Revolution are not responsible for, and may not honor, tickets sold in violation of applicable law, or stolen, lost, or counterfeit tickets. Where should I purchase tickets? Ticketmaster is the official ticket vendor for all Gillette Stadium events. All individual Patriots and Revolution game tickets are sold online through Ticketmaster or by calling Ticketmaster at (800) 745-3000. The Gillette Stadium Ticket Office does not conduct any sales over the phone. The Gillette Stadium Ticket Office does not sell tickets directly on the day of the general public sale. Any tickets remaining from the general public on-sale will be sold through Ticketmaster or in person at the Gillette Stadium Ticket Office during our normal business hours. For more information on Patriots tickets, please visit https://www.patriots.com/tickets/nfl-ticketing-network. Buyer Beware: If you are not purchasing tickets through an authorized seller, make sure it’s from a website/person(s) you trust. Brokers create websites/URLs similar to authorized websites to make you feel as if you are purchasing from an authorized vendor. Do NOT post pictures of your tickets on social media. Brokers will use them to create counterfeit tickets. Make sure that you read the terms and conditions of each secondary market website prior to purchasing tickets. Many secondary market websites do NOT offer refunds for invalid tickets. How to spot a counterfeit ticket All tickets purchased through secondary markets are at risk of being invalid counterfeit tickets. All secondary market vendors have produced invalid counterfeit tickets that have been rejected at our stadium. The Gillette Stadium Ticket Office is unable to confirm the validity of tickets prior to entry into the stadium on the specific event date. What happens if my ticket does not scan? If your ticket(s) do not scan at the gate, please see a customer service representative located at the Ticket Office. These representatives will be able to offer an explanation regarding your ticket(s). If your ticket(s) don’t scan and they are brought to our office, the invalid ticket(s) will be confiscated. A photo copy of the ticket(s) will be given to the guest for their records. On game day, the Gillette Stadium Ticket Office offers each guest the ability to file a police report with a police officer. If there are any tickets for sale, guests are welcome to enter the sales line for a chance to purchase valid tickets sold at face value. 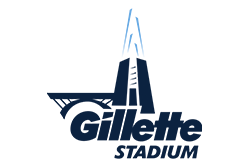 The Gillette Stadium Ticket Office does not provide any scan reports for any event at our stadium. Patriots: There are currently no group tickets available for Patriots home games. For more information about Premium Seating options, call (508) 384-4370 or email vipsales@patriots.com. Revolution: There are a variety of group ticket options for Revolution home matches. For more information about Revolution Group Packages, contact the Revolution at 1.877.GET.REVS or email cs@revolutionsoccer.net. Additionally, you may visit revolutionsoccer.net/tickets/group-tickets. One of the best ways to assure against lost or stolen tickets is to utilize mobile ticketing via the Gillette Stadium app. Patriots Season Ticket Members: Only the season ticket holder of record, with proper identification (driver’s license, passport, or State Identification card) can obtain the replacement ticket(s). On any ticket replacement, a $15 non-refundable processing fee will be charged at the time of replacement. If tickets are stolen, a police report must be filed with the agency having jurisdiction where the theft occurred. A copy of the police report must be presented to the Gillette Stadium Ticket Office prior to replacement ticket(s) being issued. Revolution Season Ticket Members: Only the season ticket holder of record, with proper identification (driver’s license, passport, or State Identification card) can obtain the replacement ticket(s). If tickets are stolen, a police report must be filed with the agency having jurisdiction where the theft occurred. A copy of the police report must be presented to the Gillette Stadium Ticket Office prior to replacement ticket(s) being issued. Concerts/Other Events: If you lost your ticket (or believe it has been stolen) to a Gillette Stadium event, you must return to the original point of sale (e.g., Ticketmaster) as only the originator of the sale will be able to assist you. Patriots: Digital ticketing is enabled for all Patriots home games for both Season Ticket Members and those who purchased tickets directly through the NFL Ticketing Network. Secure, digital tickets are easily accessible via the Gillette Stadium App which is available on the App Store and Google Play. Revolution: Digital ticketing for Season Members and Multi-Game Package Holders at Revolution home matches is enabled via the Revolution Account Manager. Digital ticketing is also enabled for guests who have purchased tickets on www.ticketmaster.com as well. Concerts: Not all concerts at Gillette Stadium accept digital tickets. We recommend you always check the respective Event Guide. For Gillette Stadium concerts that do accept digital tickets, it is enabled for tickets purchased directly through Ticketmaster, Gillette Stadium, or their agents. Digital tickets can be scanned through the Gillette Stadium App on iPhone and Android devices. Patriots Tickets: We only accept cash or Visa. Visa is a proud sponsor of the five time World Champion New England Patriots. Revolution/Concerts/Other Events: Visa, MasterCard, American Express, and cash are accepted. Patriots: The majority of Gillette Stadium is occupied by New England Patriots Season Ticket Members. As such, there are no seat upgrades available for Patriots home games. Revolution: To purchase New England Revolution Seat Upgrades download the Gillette Stadium App on an iPhone or Android device and select the Seat Upgrade button in the tickets menu. Select an upcoming game and register using your mobile phone number and email address. Once Upgrades become available, we will text you. For more information, visit www.revolutionsoccer.net/matchday/seat-upgrades. Review the Gillette Stadium Ticket Terms & Conditions here. Will Call is located at the Gillette Stadium Ticket Office which is in the NRG Plaza across from the Patriots ProShop. Will Call is open four (4) hours prior to Patriots games, three (3) hours prior to Revolution games, and when parking lots open for other stadium events. Tickets left at Will Call can only be released to the person whose name appears on the Will Call Ticket Envelope. Photo identification is required. Individuals are not allowed to leave tickets at Will Call for another party to pick up, and individuals must pick up all tickets left for him/her.